And then, after all that goodness, I hopped on my bike and rode over to the Grandin Farmers Market for the first time this year. Yes. It’s almost June and I’d yet to go to my favorite place in Roanoke. Honestly, I was dreading it a little. This is my fifth year going to the market–I know the farmers and vendors so well now that I consider them friends. But at the same time, the last three I’ve been going with G and he’d become a part of that routine. I wasn’t keen to go and have to answer any questions or anything awkward like that. And you know what? It wasn’t uncomfortable. It was just wonderful to see people I hadn’t seen in months, give and receive big hugs, and catch up on how the winter and early spring had been. I’d also been avoiding the market because…well…I haven’t exactly been cooking much. And when I do cook, one batch of food lasts an entire week and that’s not utterly inspiring for my life or the blog. So I figured that today would be the day to start trying to incorporate small batch, creative cooking back into my life–starting with something that requires zero cooking at all. Funny how that happens! This kale salad is 100% inspired by the local produce here in Roanoke and also 100% inspired by the simple but utterly delicious salads I ate in Barcelona last year. There was something that really stuck with me about those salads. They were simple affairs–mixed greens, maybe some walnuts, a piece of goat cheese, and then just a small amount of quality olive oil, a dash of vinegar, and a bit of honey drizzled on top–but memorable in their simplicity. With this one, I used what I had on hand and what I bought at the market this morning–some Tuscan herb olive oil a friend gifted me, white balsamic vinegar, agave, kale, arugula, fresh shelled peas, and pistachios. The greenness of Spring embodied on a plate. 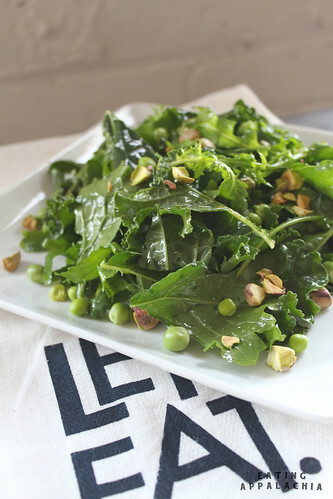 There’s nothing difficult about the salad, but in it’s sparseness, the fresh sweetness of the peas and the spicy bite of the arugula and the nutty quality of the kale really shine through. Spring, I’m glad you’re here, even if you are marching every so quickly towards summer. Wash the kale and arugula and spin dry. Tear the kale into bite size pieces and place the kale and arugula in a mixing bowl. Drizzle the balsamic vinegar, olive oil, agave/honey, and a pinch of sea salt over the greens. Toss with your hands to combine. Plate and sprinkle with the fresh raw peas and chopped pistachios. Same here! I stopped cooking for a while, I was boring even myself with my food – and then yesterday I finally bought groceries and am stoked to make a nice salad for lunch. Nothing like a walk through a farmer’s market to get some fresh inspiration. This sounds like such a relaxing weekend! Especially when you get to eat all the veg in the land. One of the vendors at our market always has huge bins of every green you can think of, and baby kale is definitely among them. I should get some one of these days (you know, once I’m finished getting through all the greens I got in our CSA box this week and seem likely to continue getting every week until fall). Getting through big life changes is always tough, but it sounds like you are doing really well, which is awesome. Building your own traditions! Yay! Sounds like a lovely relaxing weekend! Mmmm this kale salad looks delicious! Love all the ingredients you put together!